Magnet strengths are increasing. Implants and devices enter the market regularly. MRI professionals need ongoing guidance from expert sources for screening and scanning. In a magic act, “nothing up my sleeve” is just part of the magician’s patter. Making sure there is nothing up that sleeve takes on potentially life-threatening meaning in an MRI suite, where a ferromagnetic object undisclosed by a patient or an implant that has not been tested in the MR environment could harm a patient. Screening patients prior to scanning can be the “magic wand” that protects them and staff members, but it’s not always a foolproof solution. As those who work with MRI know, this imaging modality typically utilizes a magnet that remains on 24/7 and attracts ferromagnetic elements with a force approximately 30,000 times as powerful as the Earth’s magnetic field. That same magnet can turn metal pins into projectiles and cause burns to patients under certain circumstances. While imaging professionals understand the potential for harm, MRI accident rates are climbing. Magnet strengths are increasing, and implants and other devices enter the market regularly. MRI professionals need ongoing guidance from expert sources to obtain up-to-date information on patient screening and scanning. In addition, patients, their family members, and even hospital employees from outside the imaging department often don’t understand what can happen when a lucky coin or a nondisclosed medical implant makes its way into the MRI suite. What causes MRI technologists stress is fear of the unknown. For example, it was recently discovered that over-the-counter heat wraps used to relieve muscle pain contain ferromagnetic materials and should be removed before entering an MRI suite. There is also the recent case of a child who was burned by the metallic layer of a Thermoflect blanket while undergoing an MRI. The product had been tested for use in the MRI suite, and no problems had been reported during its 20 years on the market. Tobias Gilk, president and MR safety director for Mednovus, the manufacturer of a family of ferromagnetic detection (FMD) systems called SAFESCAN, notes that typical ferromagnetic materials—most commonly containing iron, but nickel and cobalt are also magnetic—are generally known and are the items for which technologists most commonly screen patients entering the magnet room. However, a lesser-known fact is the risk of ferromagnetic and even nonferromagnetic items becoming electrical conductors, which is what may have been the case with the Thermoflect blanket. “It’s these hidden and lesser-known risks that keep technologists concerned,” Gilk says. Clinical screening of patients is the primary method of eliminating the risk of accidents in the MRI suite. While there is no industry standard for screening patients prior to undergoing an MRI, one source for such guidelines is the Reference Manual for Magnetic Resonance Safety, Implants and Devices edited by Frank G. Shellock, PhD, FACC, FACSM. Updated annually in a field continuously evolving, the 2010 edition includes guidelines and recommendations from the latest information in peer-reviewed literature as well as documents developed by the International Society for Magnetic Resonance in Medicine; the ACR; the FDA; the National Electrical Manufacturers Association; the International Electrotechnical Commission; the Medical Devices Agency; and the Institute for Magnetic Resonance Safety, Education, and Research, which was founded by Shellock. “There are many things people need to be aware of contained in the peer literature, and you can get even more information through direct contact with MRI investigators. You need to have peer-reviewed topics only,” says Shellock, who is also an adjunct clinical professor of radiology and medicine at the Keck School of Medicine at the University of Southern California. The reference manual includes “The List” of thousands of devices, implants, and other objects that must be considered for patients undergoing MRI examinations. Objects on the list have been evaluated and labeled as “MR safe,” “MR unsafe,” and “MR conditional” at given magnet strengths. The evaluations include varying degrees of conditional and unsafe. Objects categorized as MR safe are shown to have no known hazards in all MRI environments, such as plastic. MR conditional refers to items that demonstrate no known hazards in a specified MRI environment with specified conditions of use. Items that fall under this category are characterized as having weak or mild ferromagnetic reactions. MR unsafe items are those determined to pose hazards in all MRI environments and include items such as ferromagnetic scissors. Shellock says there is definitely room for improvement in the clinical screening process, starting with some inadequate screening forms that contain less-than-thorough questions or outdated information. He also notes that screeners need to make sure the patient understands the questions and the potentially dire effects of failing to answer truthfully. On his Web site at www.mrisafety.com, Shellock provides a comprehensive sample MRI screening form developed by the Institute for Magnetic Resonance Safety, Education, and Research. The first question addresses this issue clearly: “Have you had prior surgery or an operation (eg, arthroscopy, endoscopy, etc) of any kind?” There is space to provide detail for any affirmative answers. At Lexington Medical Center, the task of MRI screening begins with a phone call to patients before they even enter the hospital, Schlenk says. Clerical personnel inquire about whether patients have pacemakers and/or surgical implants and bring any concerns to the technologists’ attention. When patients arrive at the hospital, they complete a questionnaire where they are asked, among other things, to list any surgeries, implants, and “anything in your body that you weren’t born with.” However, none of these steps guarantees accuracy during the screening process. According to Gilk, the most commonly used guideline for MRI standards is the “ACR Guidance Document for Safe MR Practices,” originally published in 2002, updated in 2004, and expanded and updated again in 2007. This document covers all aspects of the MRI process, from static magnetic field-related issues and site-access restrictions to pregnancy-related issues and emergency preparedness planning. In addition, The Joint Commission issued an alert in February 2008 on preventing accidents and injuries in the MRI suite. While Gilk applauds the availability of these documents, he believes more could be done to standardize MRI safety practices. Shellock says there are misconceptions regarding postoperative MRI for patients with metallic implants or devices and what can and cannot safely pass through an MRI suite. For example, the typical waiting time before allowing a patient to undergo an MRI following surgery has been six to eight weeks. However, the only factor that currently determines the appropriateness of MRI is whether or not the patient received an implant during surgery. For example, studies in the peer-reviewed literature note that if a metallic object implanted in a patient is a passive implant with no electronically or magnetically activated components and is also made from nonferromagnetic material, the patient may undergo an MRI with an operating system at 1.5T or less as long as there are no inherent MRI-related heating issues. However, patients who have implanted devices that exhibit “weakly magnetic” characteristics typically must wait six to eight weeks after implantation before undergoing an MRI procedure with a scanner operating at 1.5T or less. That waiting period gives the implanted device time to become incorporated into tissue that essentially shields it from the effects of the MRI environment. In addition, Shellock says that contrary to common practice, research shows it is not necessary to wait until after the first trimester for pregnant women to undergo MRI. One step to consider in the ongoing attempt to keep ferromagnetic objects out of the MRI suite is to install a walk-through FMD, such as SAFESCAN Intercept Pillars, which provide ferromagnetic screening of people and equipment as they pass through the MRI environment. Gilk says SAFESCAN is designed to help catch every dangerous item that patients fail to disclose. However, he says that occasionally there is still resistance to install walk-through scanners. Anna Srb, director of marketing and sales for Kopp Development Inc, which manufactures the FerrAlert line of FMDs, adds that the general public is often unaware of the potential danger of entering an MRI suite with ferromagnetic items in or on them. In some instances, MRI departments will alter their protocols based on the types of items discovered by FMDs. “Technologists know now to ask for the things that were found by the FMD,” Gilk says. According to Shellock, FMDs may have improved MRI staffs’ ability to screen. With proper instruction from manufacturers and training for technologists, FMDs work well, he says. However, he and others stress that they should not be considered replacements for clinical screening. There are some problems with FMDs, Shellock says. 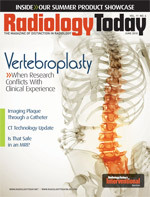 Cost can be a factor for some hospitals and imaging centers. Also, there are some instances where the MRI suite layout does not allow for proper mounting of a walk-through FMD. Such devices need to be located so that they function properly for that room and don’t detect ferromagnetic objects located outside the room. Both Srb and Gilk note that FMDs can be mounted in a doorframe to accommodate different site layouts. Additionally, handheld FMDs can be used as an alternative if an FMD’s placement remains an issue. While patient nondisclosure can be risky, situations can also occur when staff members outside the MRI suite bring in items containing ferromagnetic components. Due to the nature of their work, housekeeping staff and maintenance personnel may approach the MRI suite while carrying mops or tools. Even hospital staff from other areas such as the ICU who transport patients for scans may not be as familiar with the “dos and don’ts” of the MRI area nor are they aware of what to screen for. “Allied personnel have the authority to enter the department, but they don’t go through the clinical screening that patients go through,” Gilk says. Srb notes that hospital personnel are informed of the necessary protocols when entering the MRI suite but can forget which items are ferromagnetic, or to check for them, if they don’t regularly come into contact with that area of the hospital. She cites an example of an anesthesiologist who emptied his pockets before entering the MRI suite but continued into the area with an oxygen canister. There were no injuries from the resultant projectile, but the message of the magnet’s power was made clear.